Hey Lorraine! Thanks so much for visiting--we're all big fans. And what's it like living a double life? How do you keep your identities separate-in real life and in writing? (Sheila/Sarah are you out there?) 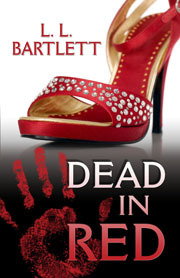 When people ask for Dead in Red, do you offer them Murder is Binding as well? Can you tell us a bit about MIB? It's getting such a buzz these days. And okay, I'll confess. I've got the shoe gene. Big time. Yes, I'm predictable. Fine. I'm wearing my pink Crocs right now. I think I have four pairs of them, so maybe I do have a shoe "thing" after all. Welcome to Jungle Red writers Lorraine--or whoever you are today! Next time you need a photo of shoes, do check with Hank. I was watching her at Romantic Times and I swear she changed from one gorgeous pair to another four, five, six times a day! I'm just jealous--I have plantar fasciitis too, chronic style. So no more high heels for me! Lorraine, you should post the link to your cool trailer--the shoes feature big-time in that! Loved, loved Murder is Binding, which you were kind enough to sign for me at Malice Domestic. How do you manage to be so prolific? Tell us about your writing day. Waving at the crowd. Do I have to tell you Lorraine/Lorna and Sheila/Sarah talk a lot? And she even persuaded me to try Crocs, although I hadn't heard about Jibbits. Where do they hang out? I find the hardest part of balancing two protagonists is trying to keep them from merging. It helps that I write one series in first-person, the other in third-person POV. They're also at different points in their lives. And my glassblower Em is much snarkier than my rather bewildered orchardist Meg. People keep telling me they hear "me" in Em's voice--I'm still debating whether that's good or bad (am I really that sarcastic?). But Lorraine (or L.L.?) is writing from a male POV! Tell us more about that. I like writing Jeff from a first person POV. I find I can channel him (which is good, as last time I looked I wasn't a man). I find third person harder to write, but Tricia's voice just isn't first person. My writing day? You mean when I actually work on a book instead of promotion? I like to write in the morning, but lately I've been getting more done after supper. Go figure. It seems like every book comes about in a different way. And I'm not as prolific as I would like. I already have two more Jeff books already written. In fact, they've been written for several years. It took a lot longer than I imagined to find a home for the series, so they're in the can while I work on new projects. I must confess I like pulling the stories out and playing with them every couple of years. Being with a small press means they won't want to see the next book for at least another six months. Then it could be another year or two after that before it sees publication. This industry moves awfully slow at times.